IMPRESSIVE, professional, job well done are but a few of the superlatives easy to come to mind in describing last Saturday's launch of a new CD by Neal & Massy Trinidad All Stars. The popular Hell Yard pan institution spruced up its Duke Street complex to launch From Tabanca to Rain, as well as to premiere the world-renowned German-manufactured Meyer Sound System. Produced by Neal & Massy Holdings, Caribbean Home Insurance and Sanch Electronix, the event was attended by a cross-section of personalities from the diplomatic corps, including Mexican Ambassador Senora Isabelle Teles de Ortega, Port of Spain Mayor Murchisson Brown, Bernard Dulal-Whiteway, Devrol Dupigny, Simeon Sandiford, Ray Holman, Dereck Faria and the local agents of the revolutionary sound system. Teles de Ortega unveiled a commissioned painting of the CD. It's difficult to decide which was more impressive, the splendid music performed by All Stars or the lavish culinary spread laid by the organising committee. But guests enjoyed both, especially when the CD was eventually played on the new sound system. Recorded on the Sanch label, From Tabanca to Rain is a must-buy item for any trueblood collector and connoisseur of exquisite pan music. 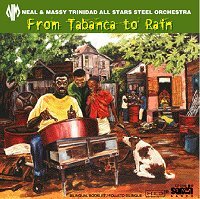 The Neal and Massy Trinidad All Stars Steel Orchestra has released a nine-track CD collection entitled From Tabanca to Rain, that will make a nice present for this the Christmas season. The collection, recorded, produced and distributed on the SANCH label features tunes played by the band for the Panorama competition over the years. This includes the 1987 piece, "Curry Tabanca," which was recorded as the band prepared for the Panorama final of that year. In fact, All Stars was one of the first bands to be recorded live on the SANCH label, which since the mid 1980's has been recording Trinidad's pan, folk, jazz and classical music and distributing it world-wide. This collection is one of almost 50 in the SANCH catalogue. These include the Special Brew compilation, Exodus Power and Glory I and II, La Petite Musicale and Classics on Pan. Featured on Tabanca to Rain is this year's All Stars Panorama offering, "Rain Melody" as well as "The Heavy Roller," "Power Of Music," "Doh Back Back," "The Caribbean Home Theme Song" and a medley of "All The Things You Are," "La Mer" and "For Sentimental Reasons."